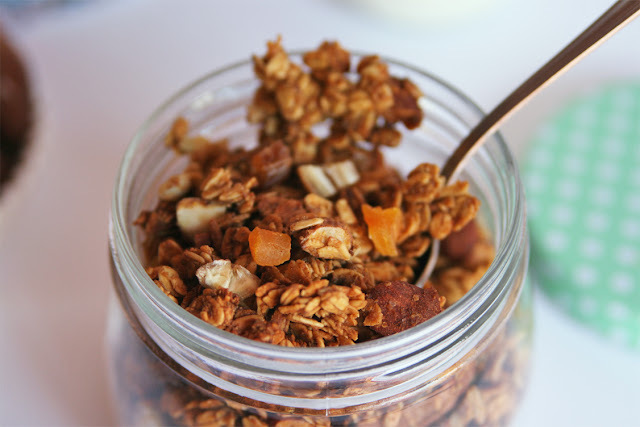 The house smells incredibly good when I'm baking this granola and it's because I love to mix my favorite spices: cinnamon, allspice, nutmeg, ginger, etc. 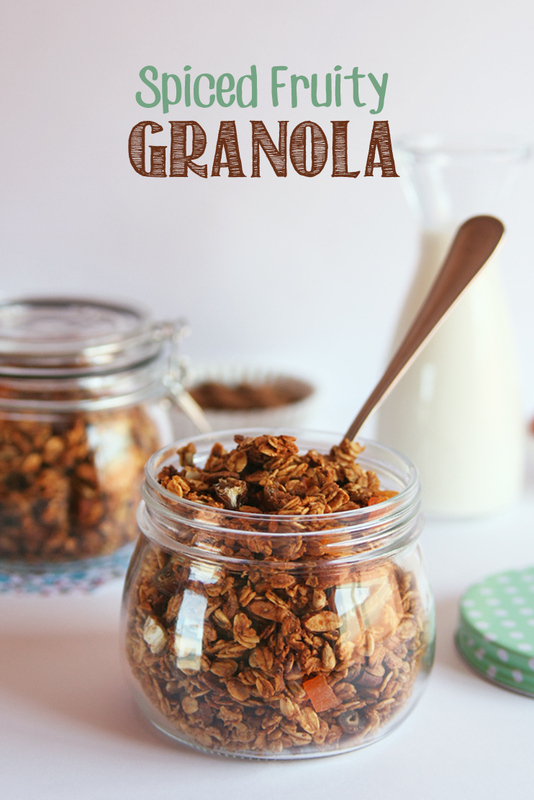 Needless to say that homemade granola is way better than store-bought; yep, there are a few great brands out there that make good organic granola but they are also quite pricey (and don't even get me started when you can only find just a couple chocolate chips or crunchy almonds on the bottom of the package). 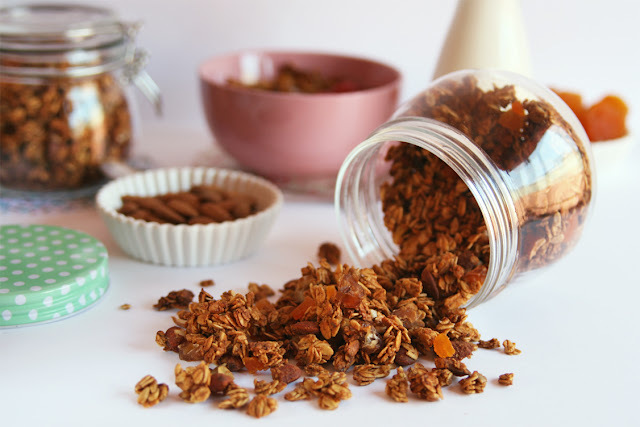 It's an easy recipe that allows you to use those leftover ingredients lying around the kitchen, in less time than you think you will have a big batch of yummy granola with mixed nuts, dried fruits, healthy fats, zero refined sugar and good energy. Choose your favorite dried fruits, I like to add chopped medjool dates and dried apricots but maybe you prefer raisins, dried currants or even figs. The same goes for nuts. It's all up to you! 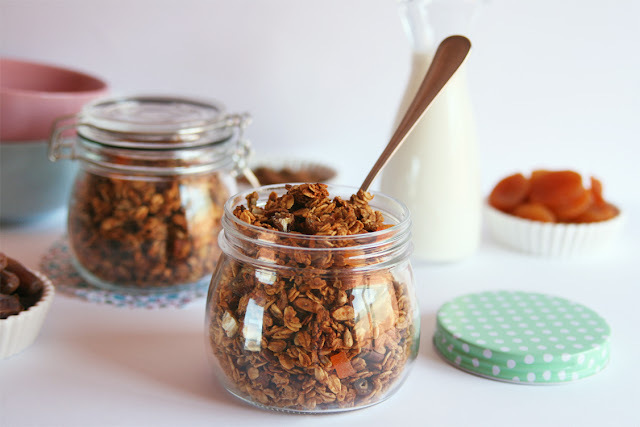 What do you prefer: granola or muesli? 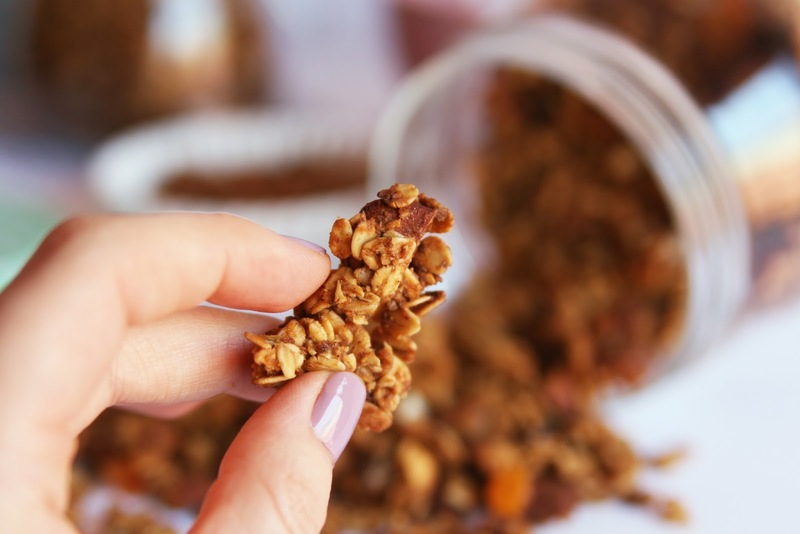 I love granola cause it's baked plus the clusters are irresistible (yes to eating handfuls straight out of the jar) so I'm definitely a granola kinda girl! I know I haven't done my usual weekly post lately, seems like I can't find enough time for blogging and some weeks I had no choice but leaving my pending posts unpublished, hopefully this will change soon! 3 1/2 tablespoons almonds, roughly chopped. 1 1/2 tablespoons raw unsalted sunflower seeds. 1/4 teaspoon pink himalayan salt. 1-2 drops organic orange essential oil. 3 1/2 tablespoons pure maple syrup. 2 tablespoons unrefined coconut oil. Preheat the oven to 150 ºC (300 ºF) and line a baking sheet with parchment paper. 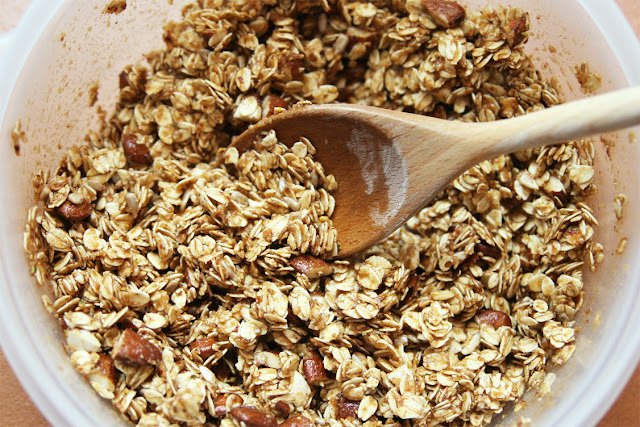 Combine the oats, almonds, flax meal, sunflower seeds, salt, spices and orange essential oil in a large mixing bowl. In a separate small bowl mix together the applesauce, maple syrup, coconut oil and sugar using a wire whisk. Add into the oat mixture and stir well, until the oats are coated and humid. 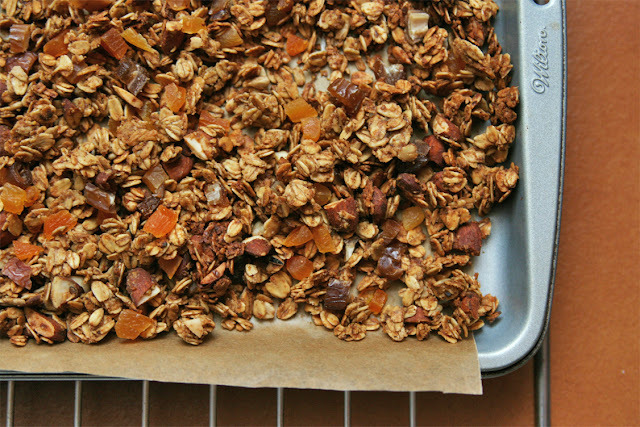 Pour the granola onto the prepared baking sheet and spread it in an even layer. Bake for 20 minutes. Remove from the oven, stir and bake for 15 minutes more, until golden. Let the granola cool on the sheet, it will crisp up as it cools. Stir in the dried fruits. Store in an airtight container (preferably a glass container/jar) at room temperature for up to two weeks. 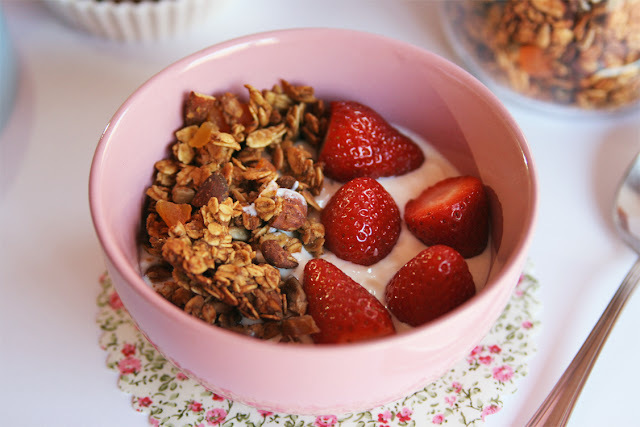 Segur que és molt bo però, no sé què ho fa, que no m'acabo d'acostumar a la granola. Potser hauria de fer-la a casa i canviaria d'opinió. S'ha de reconèixer que té molt bona pinta! 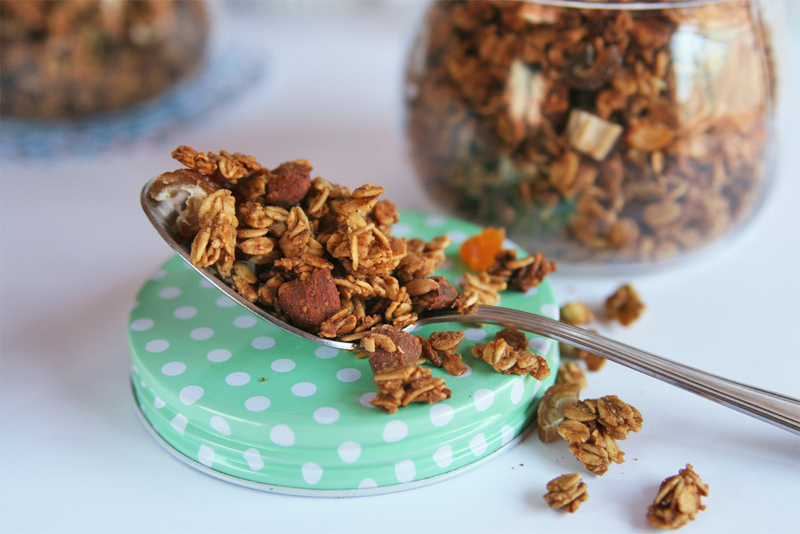 Love the look of those thick rolled oats and chunky clusters! 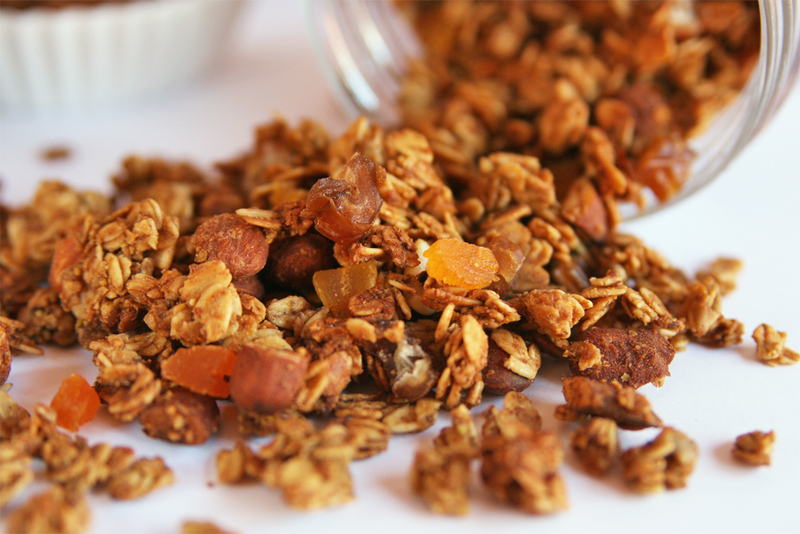 My ideal granola is super-hearty and not too sweet, so this formula looks like it would be right up my alley.